Born 20 september 1934, in Homs (Libya). Right after the second post-war period, his family moves to Rome, where the young Schifano collaborates with his father, restorer archaeologist at the Etruscan Museum. In the meanwhile he starts painting. His debut is inside the informal culture with canvas of high materico thickness. He exhibites for the first time in 1959 and yet the following year the critics show interest in his painting. 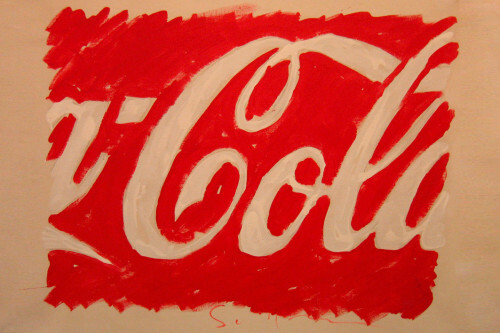 Between 1962 and 1963 he spends part of his life in the United States, where he comes closer to Pop Art. In 1964 he is invited to exhibit at the Biennale in Venice. It is in that period that he paints the anaemic landscapes, where the natural world is transferred on the thread of memory trough fragments, details, allusive writings. The artist works by thematic cycles and by the end of 1964 he marks the interest towards the revisitation of the history of art, which the following year will bring him to those famous artworks dedicated to Futurism. In 1965 he exhibites at the Biennale in San Marino and in San Paolo in Brasil. He is also authour of some underground movies. At the beginning of the Seventies Schifano starts reproducing some tv-images directly on emulsified canvas, setting them apart from the narrative rythm they belong to and reproposing them with some touches of nitre colours. The tv-image is fatuous, evanescent, immaterial, of quick use; when it is transferred on canvas and it is transformed by the artist, who in the meanwhile assimilates it, it acquires a stable value and other meaning. After a long period in which Schifano is contented between ideological and existential fears, which will of course influence his creative talent and bring him far from the artistic scene, he will take interest again in painting towards the end of the Seventies. He is invited to several exhibition, among them the Biennale in Venice again in 1982 and 1984. This is the period of his landscapes, his water-lilies, his cornfields, the movements of sea, the extents of sand re-created trough memories and sensations. The chromatic matter is rich, although of surface. The painting, impregnated of gestures, lives of an internal energy, conquers the space with his chromatic preciosity. In 1996 Schifano starts a site in Internet which will put him in contact with the world.